into the worship space for one thing or another. Maybe I left my Book of Common Worship on the communion tableSunday, or more likely my son left his iPod under the chair. But this particularly afternoon I had wandered in for some completely different reason that is lost to me now, and instead of wandering right back out I sat down for a little while, in the middle of the sanctuary in the middle of a row in the middle of the day when I am not leading worship. I got stuck there — in a good way — for a while. Breathing in deeply, slowly, I realized that this is something missing from my life. Quiet is part of it, yes. I can definitely use more quiet, more silence, more listening. It feels like my friend, Dan Wolpert, was speaking directly to me when he wrote “The work of silence is the work of gently saying no to the endless stream of thoughts and feelings that make up our world in order to listen for and say yes to the thoughts and feelings that are the voice of God” (Creating a Life with God, The Upper Room: 2003, p. 30). Do I ever have an endless stream of thoughts and feelings…. Constantly. Running through my brain and my life at all times. Learning to say no to that stream will be an important lesson for me. However, the other piece that I realized I’m missing is the experience of sitting in those seats, the ones in the middle of the sanctuary in the middle of a row. The ones where you sit if you aren’t a person (paid or volunteer) worrying about whether or not the sound system is working right, the organ stop got fixed, the worship bulletin has typos, the sermon ends the right way, or the bread will run out during communion. I miss the experience of being led in worship. As a solo pastor I lead worship all but six Sundays a year at the church I get to serve, and I truly love what I am blessed to be able to do. Really, I do. Crafting worship — digging into scripture, reading the needs of the congregation and the situation of the world, and preparing words and song and experiences through which our gathered community offers praise to God — is one of my greatest delights in ministry. And yet, at the same time, I am finding that I miss being able to worship without worrying about details. It feels like something is missing in my own life of faith because I don’t have that experience of worshiping without the anxiety that comes with the responsibility of leadership often enough. This was driven home for me even more last week when I attended the NEXT Church National Gathering in Chicago, and especially during the worship service on Tuesday morning when they broke out the organ for hymns, the preaching by Brian Eliison of the Covenant Network was amazing, and I was surrounded by friends. I was there in my church, not the one I serve on a daily basis, but the one that is scatter around the country and made up of the people I get to lean on when I am weary, laugh with when I’m feeling silly, wonder about what God is doing with all of us. And I got to worship. Standing there singing “Love Divine, All Loves Excelling” something washed over me; I need to do this more often. I know a friend and colleague of mine, Marci Glass, also a solo pastor, has come to an agreement with her congregation, Southminster Presbyterian Church in Boise, Idaho, that for a certain number of Sundays per year she worships with them, but doesn’t lead them in worship. She is led in worship along with them by another pastor. It sounds so wonderful, and not, as some will think, because it’s an extra “day off,” but because it’s a day on. It’s a day that recognizes her own spiritual need to give honor and glory to God, to hear someone else proclaim the good news to her along with the congregation, to be fed at the table of grace as another child of God, another pilgrim on a journey, another disciple following Jesus. What do other worship leaders, paid and unpaid, do to nurture your own worship life? Do you feel like you get to worship fully when you are in leadership positions? I used to think I did, but something has shifted for me. Do you get your time to be led in worship at conferences, presbytery, or other judicatory gatherings? I miss the sense of getting lost in wonder, love, and praise, and would love to hear how others have found their seats in the middle of the sanctuary. I love sitting in my seat listening to your sermons. I feel at peace there. Sometimes I feel like that is the only part of my week that I can breathe, rest my mind and just be. There are always thoughts around the edge wanting in, “What will Teens Inc be like today?” “What teens are here?” “What does my week look like?” Etc. But for that short moment in time I truly push them away. Thanks, Hjordi! It really is a wonderful thing to be a part of, leading worship. I do love it. 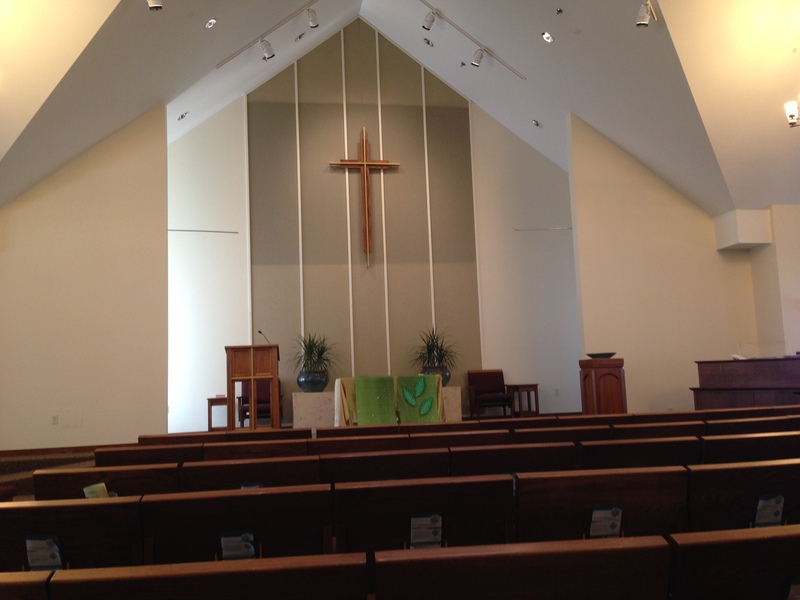 Thanks for your support, encouraging words, and ministry at FPC! I’m also a worship leader, but my team switches out a lot. We have some people on the team leading one week, and others leading the next. Everyone gets a chance to serve, and to be refreshed and renewed the following week. Although, our main leader still figures out all the details and leads nearly every week, so I’m not sure how that works. It’s nice when teams can switch out and take turns. I experienced something closer to that when I was an associate pastor. Blessings. Welcome back! Thanks for this. Stephanie, I couldn’t agree with you more. I miss just being a worshipper, mind free to receive. I too, was at NEXT and really felt connected because of the thoughtful liturgies and lots of responsive readings. Perhaps more of that kind of exchange in worship would help me feel more involved with worshipping rather than just leading. Good questions! The quality of the liturgy was wonderful. The thoughtfulness put into each piece was obvious. It’s a challenge (for me anyway) to do something even close to that each week, but your thoughts are a good reason to keep trying. There is something about numbers. When I was practicing veterinarian medicine my continuing ed conferences were life giving..seeing 2000 plus veterinarians, in all the varied ways they practice the craft, gathered. I would come home saying, “give me your hardest case…I can cure it!” Of course, reality set in VERY soon. That tends to be my experience with conferences I’ve attending the church as well. They are wonderful experiences to be sure…just wish others would partake as well. When I served as solo pastor of the only PCUSA congregation in Cullman, Alabama, we worshiped at 10:30. This gave me the opportunity to attend early worship services (8 or 8:30) in other congregations in town, from Southern Batist to LCMS to Episcopal to Roman Catholic. Doing so was a means to build ecumenical relationships, since we were the only PCUSA congregation around. It was an opportunity to experience different styles of worship and preaching, enriching my own worship leadership. But most importantly, it was my time to be a worship participant instead of a worship leader. I have not had the good fortune to live in another town where that pattern was an option. The closest I have been able to do was to attend a midweek service at the Episcopal or sometimes Roman Catholic churches in my town. It is not the same experience, however. As one illustration of the value of this experience: one week I attended a Southern Baptist congregation for its early worship service. Not surprisingly, I found myself having some theological disagreements with the preacher, not so much that I thought he was wrong but that I thought he missed the point of that day’s Scripture reading. I don’t remember the reading. What I do remember, though, is that I was engaged in his sermon in a way I seldom had been by others, because of his manner of presentation. He used no manuscript. He didn’t stay behind the pulpit. He was obviously well prepared. He had studied the passage and thought a great deal about what it said and what he wanted to say about it. But freeing himself from the pulpit and from a manuscript allowed him to communicate directly to people, to me, in a much more engaging manner than I normally did when preaching. That very morning, in my own congregation, I threw out my manuscript. I have seldom used one since then. Thnk you for your article. I hope you find a means to reclaim the joy of being a worship participant as you continue to be a worship leader for your congregation.